It was finally time to decide when to make the final leap home. Friday? Saturday? 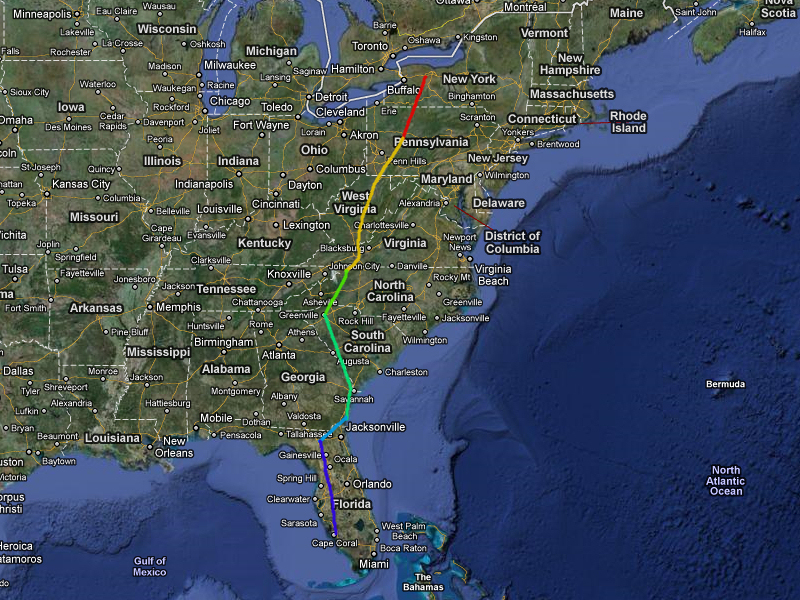 After some flight planning, we came to the conclusion that flying home Friday, June 17 would be in our best interest. Though it meant only a single night in Knoxville, and we did not want to shortchange my Dad with respect to time, the three of us were ready to return home after so much time away. 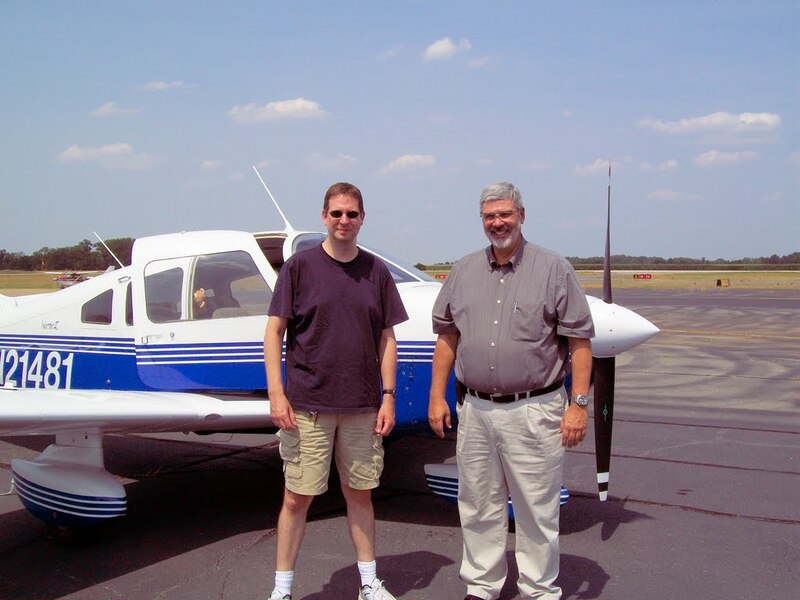 I planned to fly direct to Salem Airpark (38D) in Salem, Ohio for lunch. I learned of this destination in conversation with fellow blogger, Steve, and thought it would be nice to try someplace new. Usually, we stopped in Parkersburg, West Virginia on the way home from Knoxville. Furthermore, the forecast for west central Pennsylvania called for lower ceilings than I prefer for cross country flying. 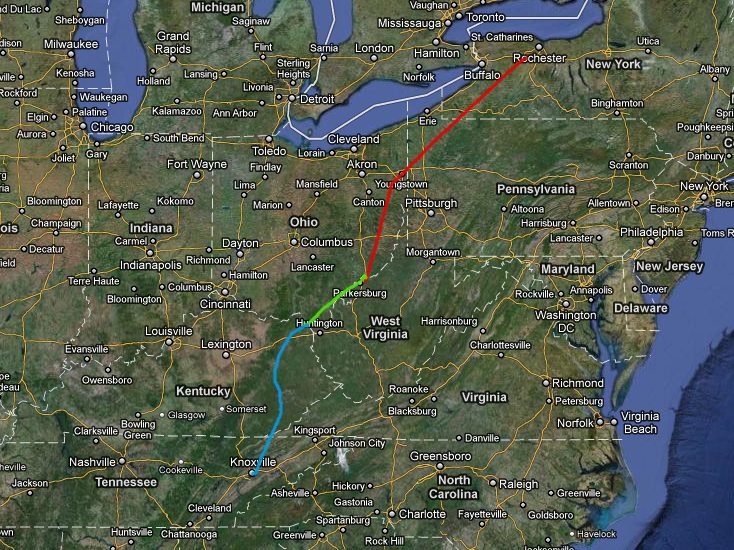 Thus, by tracking to eastern Ohio, we would avoid the need to fly low over some rather unforgiving Pennsylvanian terrain. From Salem, we would depart directly for Le Roy. Friday morning, we awoke to poor visibility along the entire planned route. We delayed departure an hour to allow conditions to improve. Nonetheless, I brooded during the drive to the airport. Would the conditions actually improve as forecast? Once we arrived, I checked the weather and discovered that visibility and ceiling were not only solid VFR for the entire route, but better than forecast. It was time to repack all that luggage in Warrior 481's baggage compartment (above). Fortunately, we had become quite adept at this over the course of our journey. The Bear took her goodbye picture with Carol and my Dad, the latter being notoriously difficult to catch smiling in any photograph (he comes by it naturally, my grandmother is the same way). We departed Knoxville and leveled off at 7,500 feet with the haze layer beneath us and high clouds above (about 10,000 feet). Our ground speed registered 140 knots (161 mph) - for the first time on the trip, we had a significant tailwind and would make Salem nearly forty minutes earlier than planned. Knoxville Approach handed us off to an unusually perky and chatty controller at Atlanta Center, the sky cleared, and all was right with the world. Crossing into Kentucky, we were transferred to Indianapolis Center. I heard a lot of aircraft requesting weather deviations, but the way ahead looked clear for us. Until, "Warrior 481, there is a line of moderate precipitation extending along your route of flight about 40 miles ahead." Uh-oh. The controller suggested that we could turn northwest (i.e., the wrong way) and pass through a hole in the line of showers. He queried another aircraft that he had just vectored through the hole and the pilot responded with, "good visibility, light chop, light precipitation". I accepted the vector and veered away from our plotted course to Salem. As we flew on, a very dark line appeared on the horizon: the advertised rain. Looking to the northeast, along our original route of flight, the sky was significantly brighter. Staring at that dark line of precipitation ahead, I had a crisis of faith. Should I follow the controller's recommendation and continue toward the dark clouds ahead or turn back on our original course toward prettier sky? In the end, I continued following the Center controller's advice knowing that he could see more of the big picture than I could. Given the length of the line of showers, it was entirely possible that following our original course would have simply brought us into contact with it later on. The controller offered an opportunity to pass through the line and leave it behind entirely. Nonetheless, I kept tabs on nearby airports in case we ran into anything that I did not like. As we drew closer to the rain showers, the hole was obvious as a gap in the line of showers at least a mile wide. I could see right through it to sunshine on the other side, whereas the air on either side of the hole was obscured by moderate rain. I made a slight heading adjustment and we plunged through the hole. Light rain spattered the windscreen, but visibility remained excellent (better than what we usually get in Georgia). To the best of my knowledge, this was The Bear's first time flying through precipitation. Within minutes, we passed through the hole and emerged into bright sunshine. The unnamed Center controller in Indianapolis gave us one heck of a good steer. This is the point where my original plan began to fall apart. We lost a lot of time flying to that hole and I needed a bathroom break. The GPS predicted another 1.5 hours to Salem and I was sure that I would not make it. While I was contemplating a pit stop, Indianapolis Center handed me off to Huntington Approach. After providing the current local altimeter, the next thing the controller in Huntington said to me was, "Warrior 481, verify you have on board weather radar." Egad. If my bladder was not reason enough to land, that question confirmed that it was time to reassess the situation from the ground. Searching the chart, I located nearby Ashland Regional Airport in Ashland, Kentucky (above) that looked like a reasonable place for a pit stop. We landed at Ashland under bright sunny skies. The weather radar depicted some minor cells northwest of our route of flight, but conditions were otherwise fine. This left me puzzled as to why Huntington Approach would query me about weather radar. It was nearly noon and all three of us were getting hungry. Salem was still over an hour away, but our favorite meal stop in Parkersburg, West Virginia was only twenty five minutes to the northeast. That was an easy decision and we went with the old standby. One benefit of the rain we flew through was that most of the grime from the deluge at McCollum Field was washed off of Warrior 481. She positively sparkled on the ramp at Ashland (above). We spotted Parkersburg from fifteen miles away, a huge "X" carved out of the forest in the middle of nowhere. As we approached the airport from the southwest, a Purdue University Cirrus approached from the northwest. The pilot, probably a student based on his radio technique, had not yet located the airport and was blindly following his GPS toward it. I asked Kristy to help me find him and, sure enough, she spotted him a few miles off of our left wingtip. When the Purdue pilot still did not have us in sight, I offered to widen our pattern behind the faster aircraft and land after him. The tower controller approved this plan (which, frankly, made his task of separating aircraft easier) and we followed the more technologically-advanced aircraft to a smooth landing on runway 21. We had lunch at Mary's Plane Place and The Bear had some of that yummy chunky applesauce she so enjoys. After lunch, I checked the weather again. There was no precipitation along the route, but ceilings were only 3000 to 4000 feet over western Pennsylvania and New York. I decided to fly north from Parkersburg to Salem, then turn in toward Le Roy. 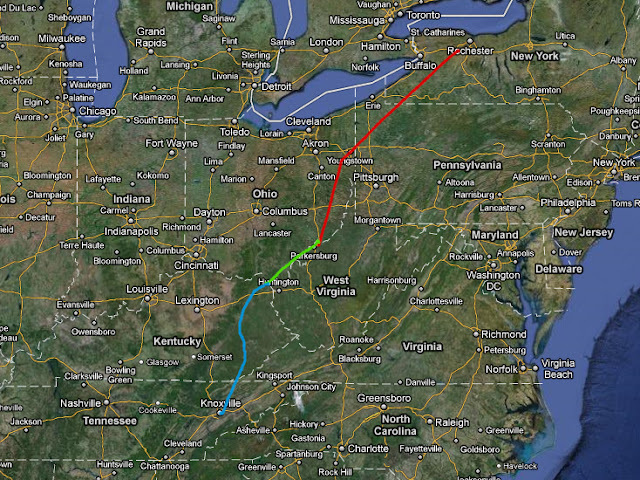 I was far more comfortable flying at 3000 feet over Ohio than Pennsylvania. Aloft at 3000 feet, the ride was bumpy. We still had a tailwind. Unfortunately, we were too low to raise Indianapolis Center for flight following. Thus, the final leg home was flown "old school", relatively low and without radio contact with anyone. Over the last few years, I have become very comfortable with cross country flight at higher altitudes while in contact with Center controllers. Despite the bumps, I thoroughly enjoyed this lower altitude cruise over lush Ohio countryside to the sound of radio silence (with rare interruptions on the Guard frequency). Kristy dozed in the back and The Bear followed her lead by napping in the airplane for the first time since we left New York the previous week. At Salem, we turned on course for Le Roy. We flew just south of Youngstown, Ohio (above). The buildings photographed quite crisply without so much atmosphere between them and the camera lens. We crossed into New York state just south of Jamestown. Soon after, familiar fields of windmills rolled past underneath. From the pattern at Le Roy, The Bear exclaimed, "I see our hangar!" We were all happy to be back home. I made a smooth landing on runway 28, graded as "at least a nine" by Darrell who was present as the sole witness of our return. The Bear exited Warrior 481 and sweetly hugged the old airplane that had carried her across the country and back. It was quite an adventure for us all. Brown Bear was truly an unsung hero in all of this, dragged from state to state without complaining once. After pushing the airplane back in the hangar, I found The Bear at her workbench ready to tend to any post flight maintenance needs. Other than needing an oil change and a bath, Warrior 481 was running great, however. Instead, The Bear was placed on bug detail. 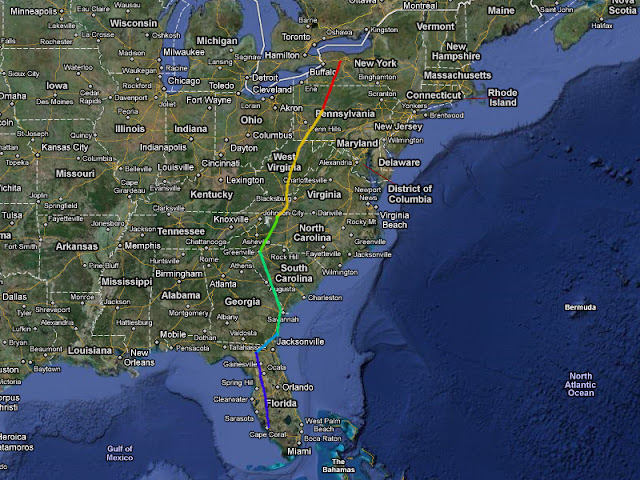 An airplane can pick up a lot of bugs flying between Florida and New York. GPS ground track for Day 7. The deviation through "the hole" is clearly shown in blue. Driving home, Kristy and I reflected on how this trip differed from the one six years ago. Obviously, bringing The Bear along made a huge impact on the logistics of travel and meant that Kristy spent less time participating in the flying than before. My cross country flying habits have changed significantly. I am far more comfortable with busier towered airports than I was six years prior, which led Kristy to comment that we had visited more "upscale" airports this time around (yes, dead frogs were invoked again). Six years ago, I had never spoken to a Center or a Bravo approach controller, let alone utilized them for flight following all the way to Florida. I had gone from relying on Flight Service Station weather briefings by phone to self-briefing via DUAT on a computer or through my iPod. Six years ago, I was a new DUAT account holder, but did not have sufficient comfort level with the system to actually brief my own flights. One thing that did not change: I carried paper sectional charts for the entire trip, despite the fact that I had access to them electronically on the iFly 700 GPS. I was glad to have had them, particularly when Fort Myers approach asked me to fly to the Lee County VOR. It was much easier to peruse the chart (which was already folded and open to the appropriate area) than to pan around on the touch screen GPS in an attempt to locate the VOR. Overall, we flew 26.3 hours (The Bear only 23.0 hours) to 13 airports (10 new to us) in nine different states (NY, PA, NC, SC, GA, FL, TN, KY, WV). Fuel prices ranged from $4.55 (Punxsutawney) to $6.76 (Marathon) per gallon. I indulged in the masochistic act of tallying up the fuel bill and discovered that we paid, on average, $5.41/gal. We saw lots of sea turtles, ZERO dead frogs, and one hail storm. We experienced passage through the heart of one of the busiest Bravo airspaces in the United States, made two Lord of the Rings references, relied on VOR navigation for the first time in years, received vectors from air traffic control around bad weather for the first time, and established a new southernmost landing point in the Florida Keys. Yet, at the end of this journey, the question foremost in my mind concerned The Bear. What was her perception of the trip? What did she understand about the distance we covered and the places we visited? Will this adventure be an important, early memory for her, or will it be lost in a jumble of early childhood experiences? Regardless, I am glad to have had the privilege of sharing the experience with her. The following morning dawned clear and cool. We ate breakfast at the hotel and requested transportation back to the airport. This caused some consternation because a driver was not available. One hotel staffer was drafted for this duty, but it was obvious from her expression that she was not happy about it. After more discussions among the staff, the same manager who picked us up the night before slid in behind the wheel and transported us back to McCollum Field. Though he was polite and his humor was good, I had the impression that he was glad to be done with us. I was slightly annoyed that the hotel would so grudgingly provide a service that they prominently advertised. We dumped our luggage in the lobby of the Atlanta Executive Jet Center and I went outside to inspect the Warrior. She was dirty. The previous night's rain must have pulled every mote of filth from the Georgian air and deposited it on Warrior 481's Matterhorn White skin. I pored over the wings, the stabilator, the cowling, and cabin roof, then sighed in relief. I could detect no significant hail damage from the night before (though washing the plane two weeks later, I found some new dents in the Warrior's thirty-three year old skin). The only issue I found was some wet carpeting inside the airplane, but better to have water in the cabin than in the fuel tanks. We departed McCollum Field bound for Knoxville Downtown Island Airport to visit with my Dad and stepmother. Above is Allatoona Lake, just north of McCollum Field. We flew over some beautiful terrain highlighted by widely scattered cumulus. Although we flew along the northern edge of the Smoky Mountains, the tallest peaks remained invisible because the range had created its own weather. Significant clouds were forming along the peaks as the westerly wind pushed moist air to higher elevation along the range. Knoxville Approach provided vectors to keep us clear of traffic around McGhee Tyson Airport. I did not get a visual on our destination until only three miles south because it was obscured by a ridge. We landed on runway 26 behind a helicopter. On every prior visit to this field, I found myself high on final approach. This time I nailed it and the landing was perfect. As we taxied for parking, The Bear waved wildly at Grandpa and Carol. In turn, Grandpa and Carol waved wildly back. After over a week of flying into unfamiliar airports, all of us found it relaxing to return someplace we had visited many times before. One week after departing New York, it was time to head north once again. The folks at Page Field's Aviation Center were terrific and allowed my father-in-law to drive his CRV directly to the airplane for easy transfer of baggage. A couple of line guys wandered over to check on us and we chatted for a moment. I commented on meeting the girl from Rochester, NY at the Marathon Airport and one of them indicated that he was from a small town in Upstate New York near Oneonta. Is anyone actually born in Florida or are they all transplants from Michigan and New York? The plan for the day was to fly north past Tampa, turn northwest and land at Cross City, Florida (CTY) for fuel ($4.98/gal). Cross City is quite close to Perry-Foley (40J), dubbed the "Stinky Place with the Dead Frog" on our last journey because, well, it was stinky and there was a dead frog in the terminal. Kristy was quite adamant that she did not want to see any dead frogs on this trip. 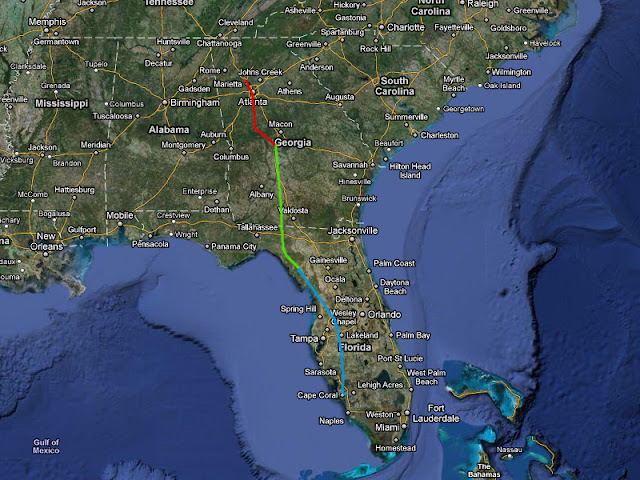 From there, we planned to turn northward to Perry, Georgia for lunch with Ed, a fellow pilot and aviation enthusiast who has been a long time reader of this blog going back about four years to the days when it was a hand-coded conventional website. Finally, we would stop for the night in Kennesaw, Georgia at the McCollum-Cobb County Airport (RYY). There, we would meet Gary for dinner, the best man from our wedding whom we had not seen since our 2005 aeronautical adventure through Georgia. We had a long day ahead of us and it was made slightly longer by delaying the flight for visibility in northern Florida to improve. We launched from Page Field around 9:00 am and climbed to the top of the haze layer. As we flew east of Tampa, the clouds below acquired a dirty amber tint and we could smell a faint trace of smoke. Something was burning below (better there than in the cockpit). The smoke accentuated the haze, dropping visibility to five-ish miles. 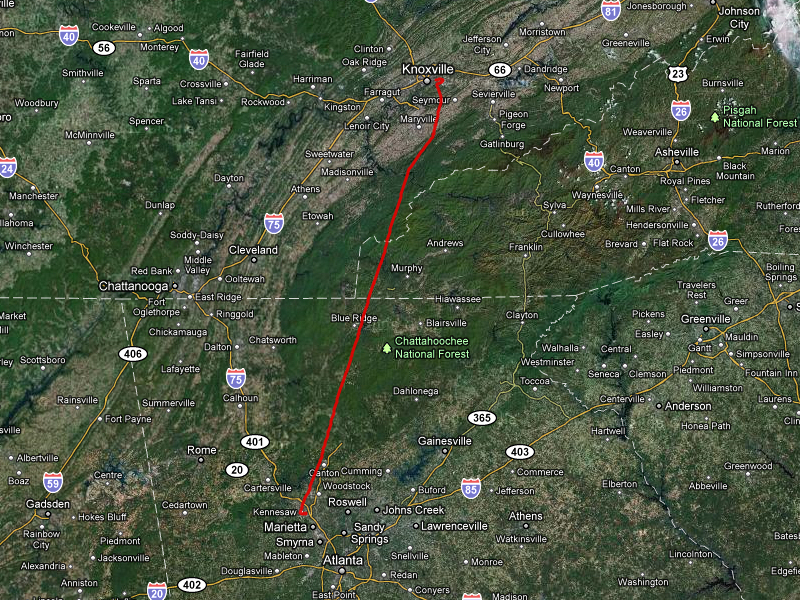 A Cessna bound for Alabama tracked behind us for a long time at the same altitude and heading. We were a few miles apart, but it took us a while to see each other (though, in my defense, the other aircraft was in my blind spot directly aft for much of that time). Tampa Approach kept good tabs on us. Cross City was mostly deserted when we landed, we only saw one person. He fueled Warrior 481 from the self-service pump, commenting that we were the first aircraft to land that day. The FBO building was nice and, mercifully, well air conditioned. As I paid the fuel bill, I noticed an autographed photo of Aaron Tippin on the counter. I am not into country music, but my old friend Greg is a fan of Tippin and actually met him once in a Detroit area Gold's Gym years ago. I asked about the photo and was shown a bunch of other pictures of the line guy posing with Tippin. Cross City is a popular fuel stop for aircraft inbound to Sun 'n' Fun each April and Tippin had stopped there the previous year. The Bear was not interested in having her picture taken as we departed Cross City. It was hot and close to lunchtime and she was just not going to have anything to do with posing. So, instead, here's a picture of my wife with three legs. But I was able to get a picture of her along with her tired Mommy once we were all back in the airplane! En route to Georgia, I commented to Kristy, "look out the left window, do you know what that is?" "Um, a kite?" asked Kristy. "Perry-Foley Airport!" I enthused over the intercom. "Your favorite place!" "Ug." Kristy was not impressed. "The last place was nicer. No dead frogs." After six years, I was surprised at how vehemently negative she remained about her encounter with the dessicated amphibian at Perry-Foley. What I remembered from Perry-Foley was reasonable fuel prices and a hangar full of demilitarized Cobras. For me, Perry-Foley was a highly rated stop! Georgia met all expectations established on our first summer foray through the state: it was hot and hazy. Much of the landscape rolling under our wings was either green (i.e., heavily irrigated) or dry. The bulls eye above shows some of the red soil characteristic of the area. We landed at Perry-Houston (pronounced "how-stun") Airport (PXE) in light wind. Ed and his wife, Joan, were waiting for us and kindly treated us to lunch. After so many years of corresponding with Ed, it was a pleasure to finally meet him. Joan was happy that Ed had someone to talk airplanes with, even if it was just for the afternoon. We returned to the airport, where Ed introduced me to Patsy, the airport manager. 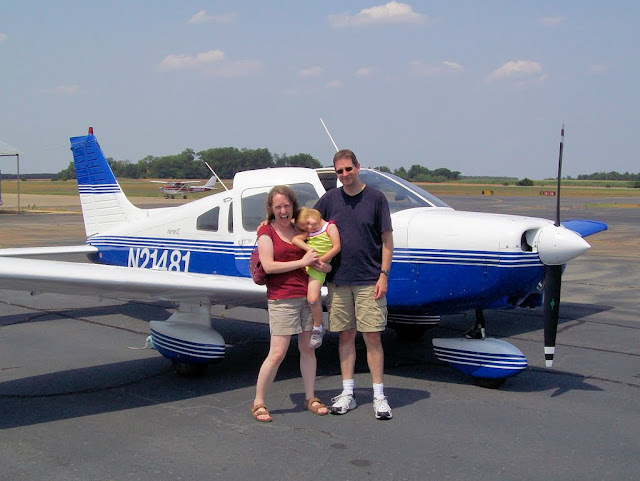 Seeing The Bear, she waxed nostalgic about her days flying a Cessna 150 with an infant seat in back. She seemed like a nice lady, so I didn't have the heart to tell her that they were all pronouncing "Houston" incorrectly. In checking the weather radar, there were some thunderstorm cells developing west of our final destination. We would likely make it with time to spare, but dawdling was not a good idea. Preparing to depart Perry-Houston, the Bear was in full-on silly mode. This evidently spread to all the womenfolk traveling in Warrior 481. If the above picture had a caption contest associated with it, my submission would be: "I wanna rock!" I shook hands with Ed and we returned to the hot, bumpy Georgia atmosphere. Unfortunately, Atlanta Hartsfield-Jackson International Airport (ATL) was directly between us and our destination at McCollum Field (RYY). 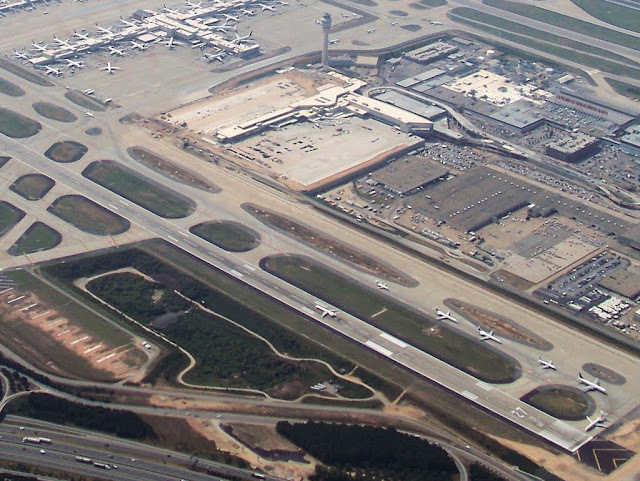 As even the most casual air travelers know, Hartsfield is a busy place: AirNav shows 2656 operations per day. Bravo airspace protectively surrounds the airport up to 12,500 feet. I planned to circumnavigate the airspace on flight following at 6,500 feet under one of the outer rings. Once two way communication with Atlanta Approach was achieved, the controller called out, "Warrior 481, how would you like to fly direct over the top to McCollum?" Over the top? I was not sure what that meant. Surely he did not mean over Hartsfield's Bravo airspace at 12,500 feet? That was higher than I had ever flown Warrior 481 and I had my doubts that we could get there in a timely manner on such a hot day. I asked for clarification. "Warrior 481, I would have you descend to 4,500 feet and provide vectors directly over Hartsfield." To paraphrase The Bear on Jekyll Island, that would be "so cool". I accepted the invitation. "Warrior 481, descend to 4,500 and fly heading 350. You are cleared into the Bravo." A few minutes later, we penetrated the inner sanctum, the core Bravo airspace directly over Hartsfield. I have received Bravo clearances before, but only in the outlying portions of airspace around Detroit or Pittsburgh. For a guy who spends most of his time flying in and out of untowered airports, who once could not talk to a controller to save his own life, the thought of going straight through the middle of the Bravo made me positively giddy. In our brief time flying over Hartsfield, we saw more landing and take off operations than Le Roy gets in a week. It was amazing. "Look at that, Little Bear. That's one of the busiest airports in the world." The Bear turned to Kristy, her voice pitched higher than usual with excitement. "Momma, Momma! That's THE busiest airport in the WORLD!" And that is how The Flying Bear went over the top. Once past Hartsfield, the approach controller adjusted our trajectory slightly to the west. Downtown Atlanta emerged from the haze to our right. We were well positioned for a left base entry to the pattern for runway 27 at McCollum. The first thing I noticed about McCollum Field was the big freaking hole...I mean, quarry...on the north side of the runway. As we lined up on final approach, it looked like that hole must go all the way through the planet. I will be honest, it freaked me out a little. The next thing we noticed was that, in contrast with all other controllers we heard on the trip, the McCollum tower controller actually had a southern drawl. There's nothing wrong with that, but it was a bit of a surprise after listening to the non-regional accents of the Atlanta Center controllers. We landed lightly on the main gear and were marshaled to parking at the Atlanta Executive Jet Center. We shut the engine down at 4:45 pm that afternoon. We had booked a room at the nearby Wingate Hotel, which advertised a free shuttle service within a five mile radius. While a great idea in theory, a practical problem emerged: the hotel staff did not quite know where to find us. The first person I talked to at the hotel was completely unaware that there was an airport two miles away. We waited over 1.5 hours for our ride and, during that time, the mother of all thunderstorms rolled over the field. Fearing that the storm would frighten The Bear, I made a game out of pointing out lighting bolts in the sky. We made a big deal about the big ones as though we were watching a fireworks show. This worked for a time and we were well entertained. Then the rain started. Rain fell in sideways sheets and water sluiced off of rooftops with incredible velocity. A car parked close to where we took cover was badly positioned - the rainwater sprayed from a rooftop valley and hit the car with an intensity reminiscent of a fire hose. When our luggage started getting wet, we retreated to a breezeway between buildings, an enclosed tunnel with openings at each end. Unfortunately, the tunnel began to flood. As water began to run across the floor, so too did a menagerie of fleeing insects. We fled again, this time to the cover provided by the entrance of the Elevation Chophouse. I took a moment to photograph the ramp (Warrior 481 is visible between the pillars at frame left). This photo does not do the storm justice. It was awe inspiring. And then the hail began to fall. I watched helplessly as chunks of ice dropped from the sky across the ramp, imagining each piece boring into the thin aluminum skin of Warrior 481's wings and control surfaces. There was nothing I could do. It was nearly 7:00 pm when the hotel driver located us. He and I were both soaked from carrying our luggage to the van. On the one hand, I was sympathetic. On the other hand, I had a wet, frightened, and hungry four year old with me who waited one and half hours for a two mile van ride. She deserved a better evening than the one she got. We dragged ourselves into the hotel lobby, soaked and bedraggled. From a couch in the middle of the lobby, Gary grinned at us and snapped a photo. Thanks, buddy. By 8:00, we were eating dinner at an Outback Steakhouse. The Bear was well behaved and let us get caught up with Gary. That night, I had difficulty sleeping. What condition would I find Warrior 481 in when we returned to McCollum Field the next day? Kristy and I took a morning trip to the Florida Keys. The Bear remained in Fort Myers with Granny and Granddaddy and had her own Numeroffian adventure. So for this trip, Kristy rode in the front seat and even set a frequency or two on the radio just like old times. The only public use airports in the Keys are Marathon and Key West. Of the two, Marathon appeared to be simpler to manage and less expensive. Frankly, I just wanted to sight see over the islands and had no need to go all the way to Key West. We decided that Marathon would be "best in the long run". This is I-75, also known as Alligator Alley, because it runs directly across the Everglades. I could not imagine a more desolate stretch of highway anywhere else this side of the Mississippi. The Florida Everglades with the Gulf of Mexico just beyond. The water was so still that it reflected the clouds like a mirror. Miami Center maintained a watchful eye on us as we flew over this beautiful, but desolate landscape. 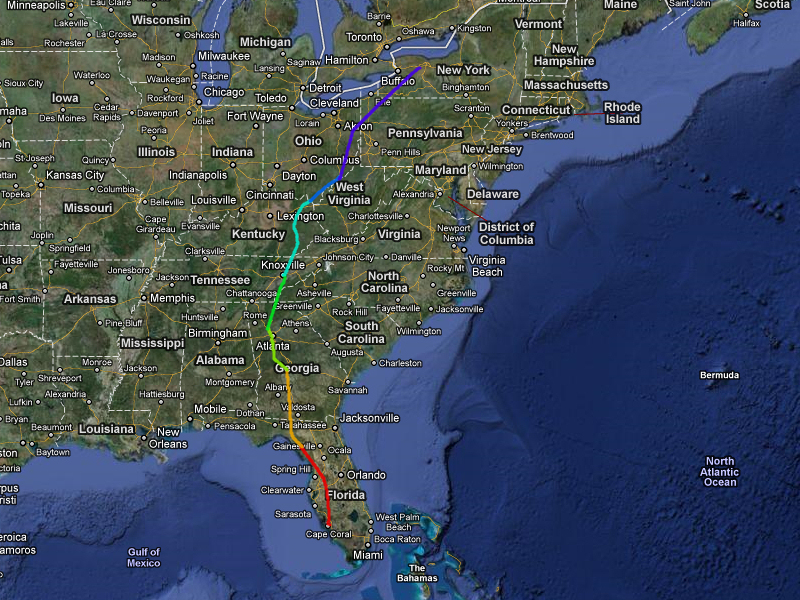 My original plan was to fly to Key Largo, closest to mainland Florida, then follow the chain of islands to Marathon. Once we reached the southern tip of Florida, however, it was clear that there were so many little islands within gliding range that we diverted across more "open" water. Another good reason to do this was that President Obama was expected in Miami, shutting down the airspace in a 30 mile radius. The Temporary Flight Restriction was not scheduled to become active until 4:00 that afternoon, but I gave it a wide berth anyway in case the activation time changed while we were en route. Starting out across the Atlantic. The chain of islands carrying US-1 to Key West can be seen at the top of frame. 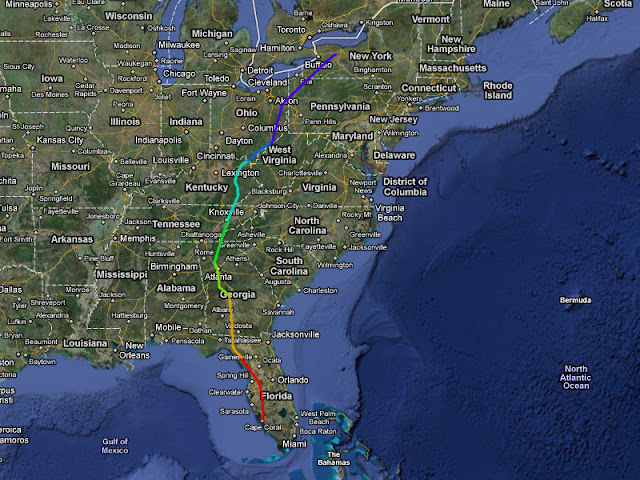 We quickly reached the Keys and flew north of them within gliding distance. The water was so amazingly clear that every contour of the bottom was visible. This Key is a little off the beaten path of US-1. This Key had a sandy peninsula projecting northward. At the end of that peninsula, a mammoth residence was being constructed. I suppose that having your own peninsula is the next best thing to having your own island. Miami Center cut us loose within a few miles of Marathon and we began a descent. Here is Warrior 481 parked on the ramp at the Marathon Airport, our new southernmost point of landing. We had a late second breakfast (who knew that hobbits flew airplanes?) at the Island Tiki Bar and Restaurant, complete with thatched roof for authenticity. After all, any place known for its deep fried key lime pie has to be good, right? We missed the start of lunch by five minutes, but our breakfasts were fantastic. This was the view from our table as we ate. When we were done, Chris (or Kris?) from the Marathon Airport picked us up for the return trip. In casual conversation, we discovered that Chris (Kris?) was from a suburb of Rochester immediately south of where we live. Crazy. Conch-Air maintains a beautiful WACO biplane named "Sweetie Pie 2" for sightseeing flights. Here it is taxiing past Warrior 481 for departure. After watching Sweetie Pie 2 depart, we also took to the sky hoping to return "home" before any thunderstorm activity could start in Fort Myers (it never did, the place stayed dry as a bone). Departing from Marathon, we were aligned with US-1 traveling northeast back toward mainland Florida. Looking to the west, we could see cumulus building over the Gulf. One buildup in particular hovered just offshore from the western tip of Florida. The clouds building from frame center toward the right were moving inland. Our objective was to miss those without flying under the gathering storm offshore, which we accomplished without any difficulty. This was taken looking north toward the southern tip of Florida. We were still "island hopping" at this point, flying within gliding range of the several islands spanning the gap between the line of Keys along US-1 and the mainland. Looking due west over the Gulf from mainland Florida, we saw this massive thunderhead taking shape miles away. To paraphrase Gary Larson, this is one of nature's ways of saying "do not touch". We overflew the Ten Thousand Islands as we flew along Florida's gulf coast. Ten Thousand Islands? Is this all about Florida trying to one-up New York? This is Marco Island. The population density looks to be a little high for my liking. Here's a close-up of Marco (high zoom from 8500' and miles away). Yikes! Marco Island is all canal and housing. With Naples in sight, Fort Myers approach issued an interesting set of vectors. "Warrior 481, fly direct Lee County VOR, descend your discretion to three thousand five hundred, and cross International Airport at midfield." Ummm... This is where some local knowledge would have helped. I had no idea where Lee County VOR was and it was not immediately obvious to me that "International Airport" was Southwest Florida International (Fort Myers, RSW). I scanned the sectional for a moment before finding the Lee County VOR on the field at RSW. In the pause I took to get my bearings, air traffic control issued the vector again and I repeated the instructions. Once I had my bearings, the vector made a tremendous amount of sense. Page Field, northwest of International was landing on runway 23. By bringing me directly over the top of International at midfield, I crossed their runway on an orthogonal trajectory that would establish me on an extended left base for the active runway at Page. Clever. And so, for the first time outside of a training situation, I actually needed to tune and track a VOR. And I did. And it was good. We rode the beam over a dense sprawl of civilization, crossed International's runway at midfield, and were passed to Page Tower. The landing at Page was uneventful, though somewhat tense given that we preceded a jet whose pilot was completely unable to get a visual on us despite multiple prompts from Page Tower. Our excursion to the Keys was some of the most enjoyable flying I had done in a long time. Calm air, gorgeous scenery, the thrill of going someplace new, and time with my wonderful wife. It does not get any better than that.